Photos courtesy of Eugene Lee; collage courtesy of Stephanie Butterworth. Orpheus: A Junkyard Opera, directed by Mat Sweeney and Sebastian Peters-Lazaro, marks Four Larks' auspicious Los Angeles debut. It's an odyssey of love and loss portrayed, appropriately enough, as an opera, a junkyard opera, that takes place in hell. Its experience is edgy and ethereal. 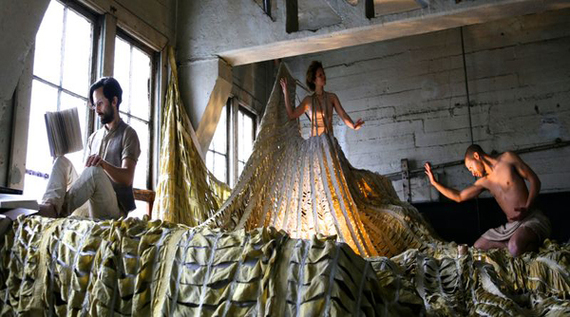 The costumes and set material are made from repurposed objects. The space is a fabric warehouse set in a dodgy part of town. And the original score (Sweeney, Ellen Warkentine, Jesse Rasmussen) is performed by a live orchestra. It's theatrical but, like Cirque du Soleil, it's more than music, song, movement, choreography, and art. It doesn't limit itself to one genre, just as love doesn't limit itself to one feeling, one moment, one lifetime. It recounts the story of Orpheus's (Zachary Carlisle) attempt to resurrect his newlywed wife Eurydice (Lisa Salvo) after she's sent to hell because a snake bites her. It's a stupendous production, it's awe-inspiring, and it's incredibly moving. Sweeney's and Peters-Lazaro's staging is spectacular. Amidst this tale of love lost and almost reclaimed is an intriguing version of hell. It's not what you'd expect. It's not fire and brimstone; it's not loud and wailing. Its denizens are tortured, eternally, but their suffering is more mental and emotional than physical. The Four Larks' Orphic version of hell is a bureaucratic nightmare. We experience the sights, the people, and, especially, the sounds of this hell from Orpheus' point of view. His quest isn't existential, it's task-oriented. Though music graces each moment of the production, it's low-keyed, as if we're hearing only what's in meistersinger Orpheus' head. The hellbound fill their days with tasks that are pedestrian and, because they're unachievable, repetitive. The space is unsavory but it's not threatening. The Four Larks' intent is to show how, in an urbanized, ADD world, no fate can be worse than to be mindlessly unstimulated. The result is damnation by cubicle-like boredom and frustration. The space is a brick warehouse on Central Avenue, as far in spirit if not location from Theatre Row as Venice Beach is from Venice, Italy. Winding past curtained-off spaces and down tight, narrow corridors, a night at the theatre feels like a field trip to a carpet mortuary. Our entry into the catacombs to the stage echoes Orpheus' own excursion into hell. On the sand-filled stage, suitcases serve double duty: as a metaphor for Orpheus' voyage as well as the literal slope of Sisyphus' (Max Baumgarten) mountain. A squash racket serves as the oar with which Charon (Reuben Liversidge) ferries Orpheus across the River Styx while some very clever movement portrays both the boat and the river's swells. The show's tone is tedium sepia, not infernal red; it doesn't as much thunder with terror as visually buzz with shades of UPS brown. The music is not Wagnerian (no, gas jets don't shoot flames across the stage). 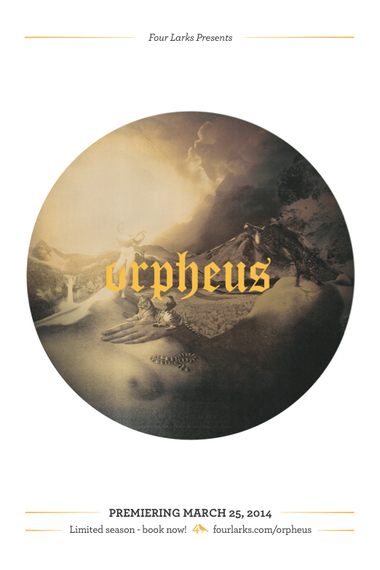 To best reflect Orpheus' musical though one-track mind, it's minimal, like the work of John Adams and Philip Glass. But it's the leitmotif of unfulfilled actions that anchors the look and action of the production. There's Sisyphus pushing that rock up that mountain of suitcases, only to have it tumble back down once it reaches the top. There are the Danaids trying to fill their buckets with river water, a task made impossible because the buckets are sieves. There's Tantalus (Caitlyn Conlin), reaching for fruit that hangs from a tree, only to have the branch jerk up at the last moment, the fruit eluding his grasp. And finally there's Orpheus, who has to negotiate all these administrative challenges, ranging from Hell's three-headed guard dog Cerebus to its royal family of Hades (Mark Skeens) and Persephone (Cassandra Ward). Heartbreakingly, he almost succeeds. Fusing a spot-on vision of a latter-day hell with a timeless story of love lost and almost found, Orpheus is a wildly success update of the Orpheus myth. It takes you someplace new which, when you think about it, isn't that new at all. That it's both hip and classical testifies to the Four Larks' achievement here: the classics are, in the right hands, still relevant, life affirming and, most of all, fun. If you scurry, you can get tickets for tonight's (Sunday, April 6) last show of the run. The show starts at 8:30, Tickets, including service fees, are $21.69 and $26.87. For tickets as well as information on past and future production, please visit http://www.fourlarks.com.